As with many towns, Hexham is faced with pressure to develop its greenfield and greenbelt land while brownfield sites within the build up area stand idle. As TT members will no doubt be aware, two large housing schemes are now being consulted on by the County Council. Both are at the east end of Hexham and they are likely to have major implications for the general future of Hexham’s greenbelt. Opposite the Arnold Clark Garage, within Hexham Green Belt, is a proposal for 28 ‘affordable’ housing units, proposed by Two Castles Housing (ref 13/02253/ful). At a full mile from the centre of Hexham many do not believe that this is a sustainable location. It is likely that it will also set a precedent for further encroachment on the greenbelt at the west end and east end if it is allowed to proceed. The deadline for comment on this case to NCC is 7th September. Opposite this site is the greenfield ‘Outline’ proposal for 128 ‘executive’ houses at Craneshaugh, (ref 13/01208/out). This site is a housing allocation arising from the old Tynedale Local Plan, but was designated to meet Hexham’s long term housing needs once brownfield sites within the town were exhausted. Many would argue that this is clearly not the case and that there are plenty of unused and underused brownfield sites that have yet to be developed. Some commentators, notably Hexham Civic Society, maintain that release of this site will require a comparable release of a greenfield site to provided for the capacity lost. As such, HCS have lodged an objection and would urge others concerned with the integrity of Hexham’s greenbelt, whether in the east or west to consider the implications of this scheme. The scheme has yet to go to committee and we understand that there is still time to make your views known to NCC. To illustrate the potential of brownfield sites within the town HCS are holding an exhibition 3rd-11th September on the potential of the 4 hectare workhouse site. 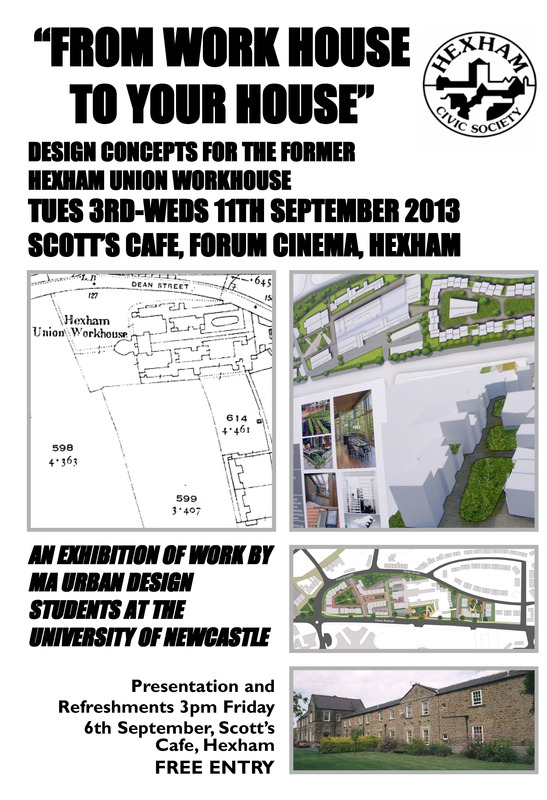 The event will display the work of MA students in Urban Design who have spent several months using the site as a theoretical project for affordable, cooperative and market housing. The exhibition is at Scott’s Cafe, Forum Cinema, Hexham and you are invited to attend a short talk by the course Tutor at 3pm on Friday 6th – refreshments will be provided. We hope that you will be able to attend. For me, to develop a brown field site makes much more sense than building on yet another field. Fields should be used for growing food and supporting wildlife. The workhouse site is a great cheap alternative car park for the hospital – but much better to be used for new housing !